Carbon CC frame? Carbon rims? A cutting-edge 1x12 SRAM X01 Eagle™ drivetrain? Hold your horses there partner... Or don't and let 'em run down any trail on the Santa Cruz Bicycles Bronson CC X01 Reserve Complete Mountain Bike! A reworked VPP® linkage makes this third iteration of the all mountain Bronson more efficient uphill while improving bottom out resistance and mid-stroke support. While they were at it, Santa Cruz also lengthened the reach and slackened the head tube, improving the Bronson's composure in gnarly terrain. 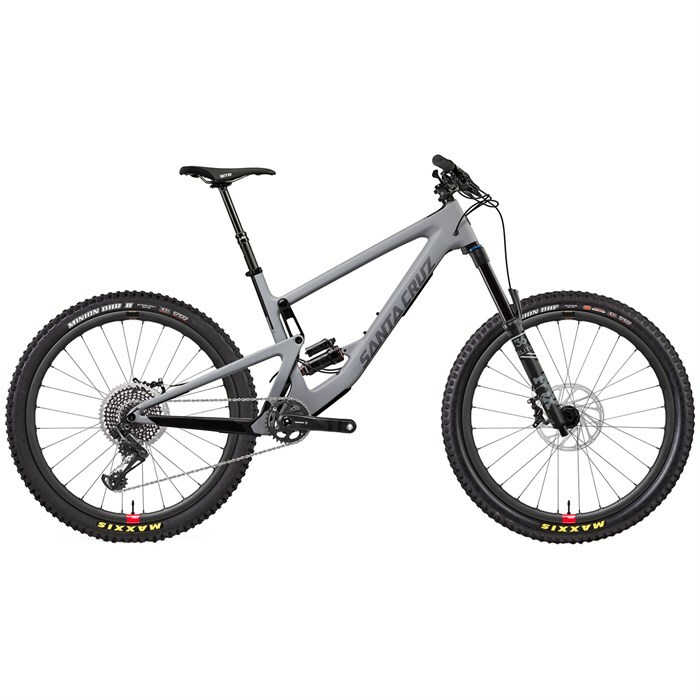 Perhaps the most versatile bike in the Santa Cruz offering, the Santa Cruz Bicycles Bronson CC X01 Reserve Complete Mountain Bike is their answer to the versatility and capability demanded by today's all-mountain riders. Carbon CC Frame  Santa Cruz's highest grade CC-level carbon frame is every bit as stiff and strong as their C-level frame, but weighs about 280 grams less, due to the use of lighter, stronger, and more expensive carbon fiber. Santa Cruz is also able to truly integrate the shock mounts, pivot mounts, dropouts and disc brake tabs into the structure, using all uni-directional carbon plies. The shock mount isn't merely riveted or bonded on after curing, but is an integrated part of the fiber lay-up. This makes Santa Cruz's carbon frames incredibly strong and able to absorb impact better than any other frame they've tested. RockShox Super Deluxe RCT  Solid Threshold adjustment for pedaling performance, compression adjustment to fine tune the ride to any trail and condition, and the proven performance of RockShox’s revolutionary Super Deluxe rear shock in a package that’s ready to tackle any challenge. Frame Update 3.0  This iteration of the Bronson features a revised VPP® suspension with a new lower-link mounted shock. This yields a smoother pedaling platform, greater bottom out resistance, and a supportive mid-stroke. Add to this a mildly slacker head angle, slightly steeper seat angle and a longer reach to make the Bronson more versatile than ever. Fox 36 Float Performance Elite  Performance Elite forks retain the same adjustments, dampers, weight, and 7000 series aluminum upper tubes as Factory Series, but have black anodized upper tubes instead of Genuine Kashima Coat. SRAM X01 Eagle™ Drivetrain  The X01 Eagle™ drivetrain signals an exciting new era of freedom and the next level of uncompromising performance for enduro racers and aggressive trail riders. Watching the world’s best racers use their parts to battle against nature, physics and time itself, has inspired SRAM to supply them with the most advanced tools we can develop. X01 Eagle™ takes everything you love about SRAM's pioneering 1x drivetrains and increases its wear life, toughness, precision, smooth and silent operation. Add to that the 10- to 50-tooth, 12-speed, Eagle™ cassette, and you have a range of gears that gives you the freedom to enjoy the benefit of 1x in any terrain, any location and at any speed. 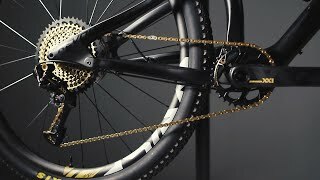 X01 Eagle™ is drivetrain freedom—how you exploit it is up to you. SRAM Code RSC Brakeset  Code RSC is built from the elements that made Guide a benchmark in contemporary brake design and performance, and delivers an extra 15% power to shine in all heavy duty applications. SwingLink™ and Lever Pivot Bearings ensure a smooth and progressive feel at the lever, while the additional 30% positive fluid volume ensures consistent performance even when braking harder, more frequently or with a heavier mass to slow down. Santa Cruz Reserve 30 Carbon Wheels  Whether it's a sunset lap with friends or a race run against the clock, a broken wheel ruins any ride. SC set strength and impact resistance as their highest priority, but strength doesn't have to mean uncomfortably stiff. Their wheels are compliant enough to avoid that harsh "wooden" ride that gives some carbon rims a bad name offroad. Santa Cruz only makes offroad bikes, so they have the privilege of being able to focus purely on the mountain bike experience. Everything from the thickness of rim beads to external spoke hole reinforcements comes purely from their experience of knowing what riders need at every level—from international racing to your local trails. Front Tire: Maxxis Minion DHF 3C EXO TR | 27.5 x 2.5"
Rear Tire: Maxxis Minion DHR II EXO TR | 27.5 x 2.4"